My friends at the UVa Scholar’s Lab shared with me their new Neatline project earlier this week. I don’t know much about Omeka, but I always trust these guys to do good work with a wide range of OS tools. I do like the interface, the rapid loading of georeferenced maps, and the additional interactive functionality on the main screen. If I can figure out more about this, I have a stack of projects ready to try! In Time & Place is oriented to secondary school learning. This will be a good resource for my Spatial Literacy students, and I’ll see about modifying things for my higher ed students too. Not sure how I wandered across this site this week. I need to click on fewer windows to make h/t’ipping easier. Conflict History is a Google Maps mashup. I like the timeline and the thorough “info” available. This interface and collection really highlights the disparity between how few military conflicts we’ve had on US soil versus the rest of the world, and how relatively high Europe and Asia are. Not news, but interesting to see it in this way. H/t to Google Maps Mania. 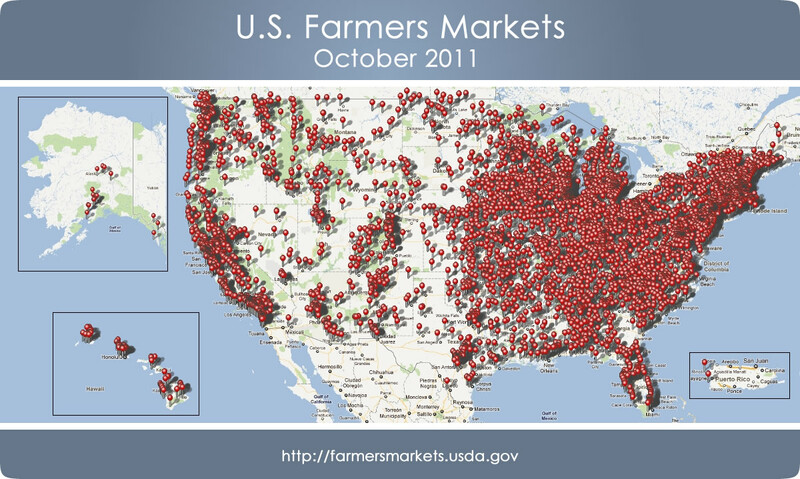 During a workshop today, I came across this USDA collection of data for farmers’ markets. Easy to download, easy to map. Don’t know how currently or accurately it’s maintained, but it’s enough to start with! Somewhere this mashup image was already part of it too. I’m not sure whether she’s still at this job, but I liked this 2007 interview that mapmaker Erin Aigner gave about her work at the NY Times.